Smaller portions served with soup or salad, one side, biscuit, and drink for our guests 62 and older. Served with choice of drink and a side item. *Two eggs any style with choice of two pancakes or two French toast, 2 bacon strips and 2 sausage links along with your choice of potatoes and biscuits or toast. Fill ‘er up! Fresh, warm, pancakes topped with homemade Apple Crisp! Topped with caramel and whipped topping! Love cinnamon rolls and hotcakes? You’ll love what we’ve done with them! No syrup required! Two pieces of thick cut bread dipped in an egg and cream batter. We grill it golden brown and top it with cinnamon powdered sugar! Served with homemade berry compote. Pancakes loaded with chocolate chips! Always a favorite! Topped with powdered sugar and whipped cream! One of our sweet Belgium waffles served with syrup, butter, and homemade berry compote. (Fresh Cut Fries topped with Maryland Crab Dip, melted mozzarella, and Old Bay Seasoning! Oven roasted turkey breast, Hickory baked ham, and bacon on a bed of house greens with cheddar, tomato, onion, cucumber, and hardboiled egg. Crispy chicken, cucumbers, carrots, almonds, red cabbage and crispy Chow Mein noodles and a bed of greens. Served with Poppyseed dressing. Our fresh and delicious Cranberry Almond Chicken Salad on a a bed of greens with tomato, cucumber, onion and hardboiled egg. A fresh, crunch mix of greens along with Hickory Smoked Bacon, sunflower seeds, and our sweet Poppyseed dressing. Our marinated NY Strip on a bed of house greens along with tomatoes, cucumbers, onions, and bacon. We then top it with our fresh cut fries and mozzarella! Our Hickory smoked bacon on a bed of house greens with grilled chicken, tomato, hardboiled egg and shredded cheddar cheese. BBQ chicken, bacon crumbles, corn, black beans, tomatoes, cheddar cheese, and an onion ring on a bed of house greens. House greens with tomato, cucumber, cheese and croutons. Tender pork slow roasted overnight with our special seasonings and homemade BBQ sauce, piled high on a toasted roll and topped with homemade coleslaw. We toast a roll and pile it high with our slow roasted (12hrs!) brisket and homemade BBQ Sauce! Awesome! We take thinly sliced corned beed and top it with sauerkraut, 1000 island dressing, and swiss cheese! Served on grilled rye. A chicken lovin' favorite! Topped with lettuce, tomato, mayo, American cheese, and bacon! Top Notch! Made just like our Chesapeake Bay neighbors do! Lots of crab, very little filler, and Old Bay seasoning! Tender grilled chicken breast topped with crab dip and our four cheese blend. All wraps include crispy tortilla strips for some crunch! The 3 B's Burger*, Brisket, and Bacon! We layer these 3 on a toasted roll along with Cheddar cheese, grilled onions, lettuce, tomato, homemade BBQ sauce! A mountain sized burger* along with Hickory Smoked bacon, American and Cheddar cheeses, lettuce, tomato, onion, pickle, mayo, on a toasted roll. House Burger* with Cheddar and American cheese along with tomato, lettuce, onions, pickles, ketchup, mustard and mayo. Bacon with House Burger* topped with melted Cheddar, tomato, lettuce, and mayo...oh and more bacon. House burger* with Cheddar cheese, grilled onions, BBQ Sauce and crispy onion ring. House burgers* with American cheese, grilled onions, lettuce, tomato, and oregano, on a toasted Hoagie Roll. Chesapeake Bay favorite! House burger* topped with our own Crab Dip, cheese, and a crispy onion ring. House burger* topped with Swiss cheese, mushrooms, and our house sauce. Two grilled brats on Martins Rolls. Served with grilled peppers, onions, and sauerkraut. Half a chicken, lightly fried and drizzled with honey. This is our own special recipe from start to finish! Also served ‘Honey Hot’! Hand cut for you from fresh port loin—a half pound of tender boneless pork happiness! Served with 2 sides and our homemade apple butter! If you're looking for homemade food to go, online ordering is the easiest way to do it! You can purchase gift cards too! 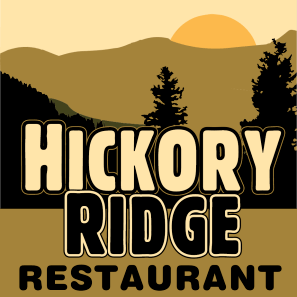 © 2019 , Hickory Ridge Restaurant. All rights reserved.